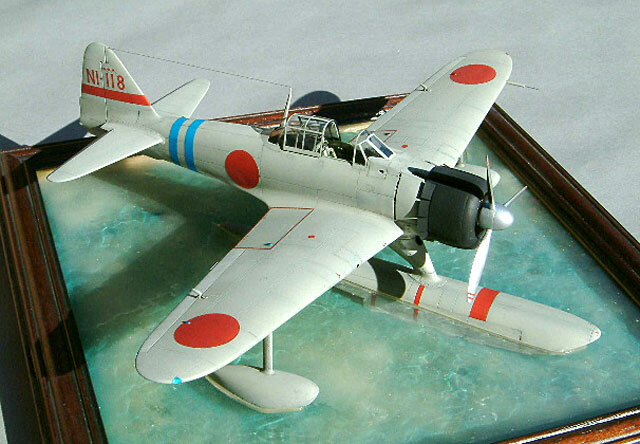 The Hasegawa 1/48 scale RUFE kit is, as you would expect, the A6M2 with extra parts. Indeed, all the original parts to make a wheeled aircraft are in the box, with the exception of the fuselage, which has tooling inserts to cater for the different marks of Zero. 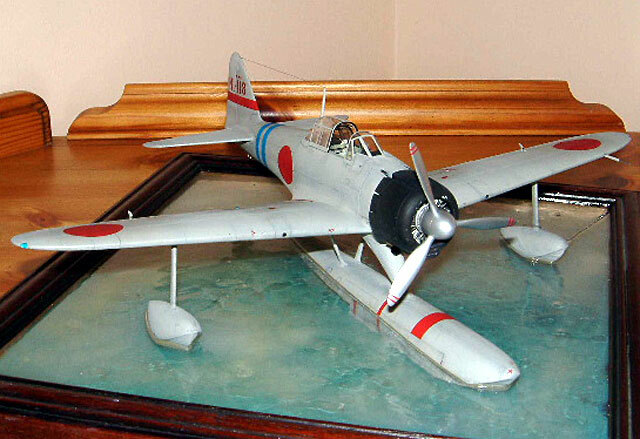 This kit has the extended rudder and ventral fin peculiar to the floatplane. I used the Eduard etch brass set for the interior, as this has a far superior seat and rudder pedals, although the Hasegawa cockpit is adequate if you drill out the holes in the seat. The etched instrument panels and acetate instruments are superb. I trawled through all the expert knowledge on j.aircraft.com to research the colours for this project, and came up with a yellow -green mix for the cockpit. Photos of the model subject and other RUFEs in the grey scheme showed that the decking underneath the canopies was black. Early on in the build, I had an idea for a waterline model. Studying photos, I determined the water ‘sit’, and then proceeded to cut the floats down so the aircraft could sit on a base. Mistake (more later). I cut out the cowl flaps and detailed the engine. 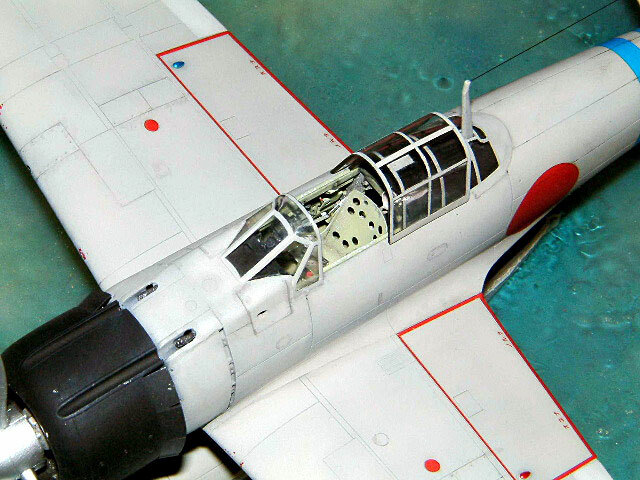 Hasegawa supply the exhaust ring, which is visible with the flaps open. I also drooped the elevators to add a bit of life, remembering to place the stick forward. I found one or two fit problems with the wings, so glued the top surfaces on to the fuselage sides and when these had set, tackled the one piece bottom section. The fit of this was troublesome around the lower cowl and under the fuselage, requiring lots of sanding and copious amounts of filler. 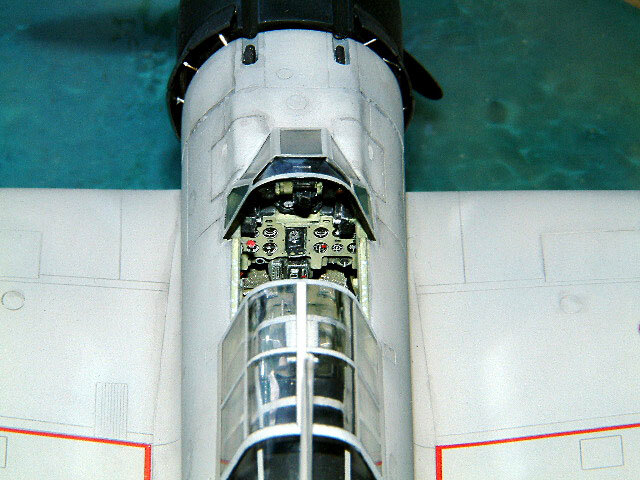 The fuselage suffered some blemishes where the tooling inserts fitted, around the tail and behind the cowl. The fit of the rear canopy was poor and required filler also. The canopy track area was filled, as the fuselage is moulded to take the sliding canopy in the closed position, and new tracks made up from strip. The canopies are very thin and clear, and the sliding hood fits over the rear section with no problems. The floats went together well but some panel lines did not meet up at the join. The Eduard set supplies some very nice flaps so these were cut out and the replacements made up and painted ‘aotake’. The model subject was in the light Nakajima grey. In photos of this aircraft it appears very pale and looks quite matt. 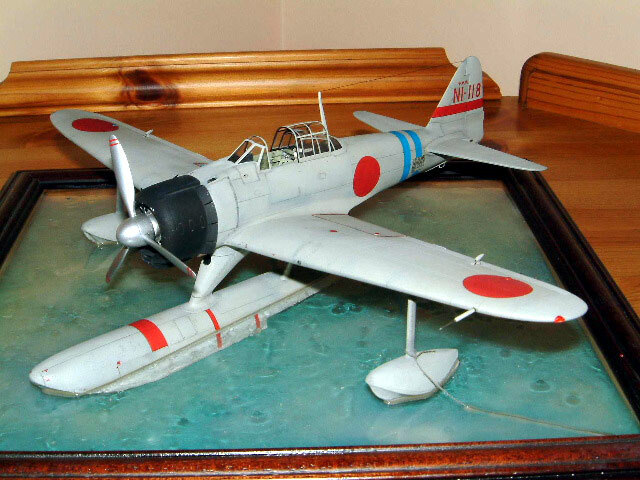 Aeromaster produced an IJN grey, but this is closer to the bluer Mitsubishi colour. 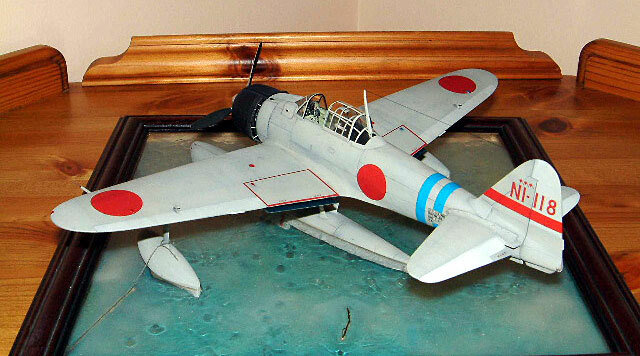 Hasegawa suggest ‘grey-Nakajima’ which isn’t much help. 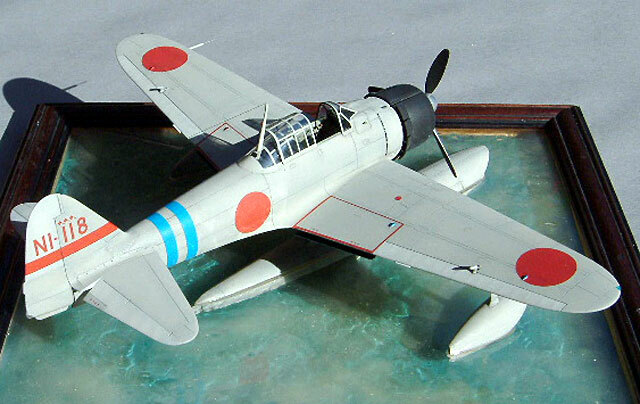 The experts on J.aircraft.com suggest light grey with a yellow-brown hue, a little darker than FS.36496. I decided to mix my own brew using Humbrol medium sea grey, white and dark stone, pre shaded with black. The fabric control surfaces were painted in a lighter shade. I risk getting flamed for the colour, but at least tonally it is right compared with black and white pictures. I initially used Eduard express masks for the canopies, as I have had good results with them on a VAL, but this time they were a disaster. It was back to the Bare Metal foil and all the resultant goo. There aren’t any after market decals available for RUFEs as far as I know, so as I had photos of the kit subject, the kit decals were used. They were very good and settled into all the details perfectly. Waterline models that I have made in the past have been limited to small-scale warships sailing on a sea of painted ‘Pollyfilla’, a white plaster like substance, which is ideal for small navies and filling cracks in your walls. I soon realised that opaque painted ‘Pollyfilla’ wasn’t going to work, and what I needed was a clear lagoon, but I had cut off the float bottoms that would be visible in the water. Idea! I mounted the model on a thin piece of clear plastic. To the bottom of this, I glued the float bottoms (reduced in depth) in line with the model. Epoxy resin was poured around the aircraft, spread out and left to set, adding a few ripples, some rope, and a branch along the way. Another piece of plastic was painted a blue- green, mounted underneath, and the whole lot stuck into a frame. Final details were fitted and some touching up done and that was it. I left off the detachable boarding ladder. I am fairly happy with the base, as reducing the depth of the floats reproduces the refraction effect of water, although I would probably just use deep resin next time and support the model in it until set. Some of the photos are in sunlight as the effect in the water is quite realistic I think.